Learn how to make and use herbal tinctures, which are simply herbs extracted with alcohol, glycerin, or vinegar. Preserve your own home herbal harvest, and bulk organic herbs in a easy to use form. Herbs: Either fresh or dried finely chopped herbs can be used. Use of one pint of menstruum to two ounces of dried herbs, or about two handfuls of fresh. The important thing is to completely cover the herbs, leaving a couple of extra inches of liquid about the herbs to allow for swelling as the herbs absorb the liquid. Leave some headroom in the jar. If using vinegar, warm first before pouring it over the herbs. Cap with a tight fitting lid, put the jar in a dark place at room temperature, and shake at least once daily. After 2 to 3 weeks, strain the contents through several layers of cheesecloth. Store in a labeled, amber glass bottle away from light and heat. The Chinese macerate herbs for months sometimes even years. 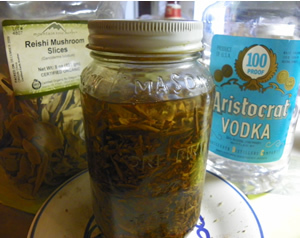 For stronger tinctures a suggested time can be 4 to 6 weeks. The duration depends on the mixture and on your patience, in time you will develop your own style. I use a kitchen cupboard that I open on a regular basis, so I don't forget the shake the bottle. Tinctures will keep for 6 months. The standard dose is one tablespoon in a wineglass of water once or twice a day. Liniments are made exactly the same as herbal tinctures, except they are meant for external use. Make sure and label your liniments "FOR EXTERNAL USE ONLY" , when using a solvent that is inedible such as rubbing alcohol. Using vinegar to tincture herbs. Alcohol has mostly displaced vinegar as a menstruum for making liquid herbal extracts, as it is far more efficient in extracting and preserving the medicinal properties of herbs. Vinegar is however passable solvent and useful in cases where you wish to avoid alcohol. When used in conjunction with alcohol, vinegar can sometimes assist in the extraction of alkaloid (base) substances from herbs. Such an extract containing both vinegar and alcohol is known as an acetous tincture. 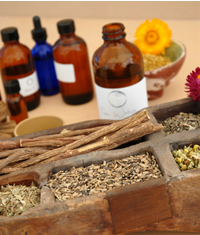 Commercial Herbal Extracts It is important to understand the labels on commercial extracts. The information should always include the ratio of herb to solvent, the percent of alcohol content along with a complete list of ingredients, and instructions for storage and use. This is not a place you want to shop for bargins. Only buy proven brands you trust. Strength is expressed in a ratio. Preserving the full range of medicinal properties often depends on using fresh plant material. Extracts made from fresh herbs generally use equal parts of plant matter to solvent, resulting in a ratio of 1:1. Dried herbs are more concentrated and the ratios range from 1:2 to 1:4.